In the free world of Android can any Bluetooth module be used for communication. In the closed world of Apple it does require the Bluetooth module further IC for authorization. 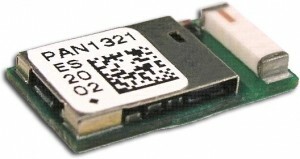 The Bluetooth module PAN1321i already includes the IC and can therefore be used to communicate with a device under Apple OS, and even Android. Those who will not use Apple OS do need the Bluetooth module PAN1321 only (no “i” at the end). The blocking of external accessories for Bluetooth is active only in the world of Apple. All other operating systems such as for example BADA, Symbian, Windows or even RIM do not need this IC for authorization. The Bluetooth modules PAN1321 and PAN1321i and are pin compatible. A certification of the device should be best done in parallel with both modules. This will save costs. If the numbers in mass production will end to sky-rocket, a redesign at the chip level (Intel PMB8753/2) will help to reduce the costs again. Anyone who is unsure to use the Bluetooth module PAN1321i or better to prefer the PAN1321 is welcome to send an email or give a call. In the consultation we will determine if SPP profile or may be HCI is more suitable. The hassle issue of the antenna and the range can also be addressed by the way. The antenna can be run on demand a ceramic monopole, a chip antenna (loop) or just a PCB track. Also, the antenna outside of the housing is a possible option. Thanks in advance for any request to harald.naumann (at) gsm-modem.de. I am doing interface my android phone. Kim, sorry but I have no code. I need to develop a BT device wich makes use of the HDP Protokoll. The Pan1321i is only certified for SPP. Can I use this BT module together with BlueZ without having to perform a new bluetooth-certification and still be able to display a Bluetooth logo on my device? Hi Cesare, I will come back to you by email as well. The PAN1321i is a Bluetooth module with Serial Port Profile. The profile is already on the module. For BlueZ you need a Bluetooth module with HCI. BTW, with Windows it is the same. Anyhow, the stack is on your PC or embedded PC and the module is seperated. I was in a training regarding this topic. It is already late. Please give me some more time to answer it more detailed. I have several questions toward this module, and it would be great if you can help me. Have you used this module, and do you have any comments to it? Is the apple authentication processor “included” in this module so that I don’t need extra components to get connection to this module using iphones? Jay, my daily job is Field Application Engineer for wireless applications. Please drop me an enmail to harald.naumann (at) gsm-modem.de . As soon I am back from my business trip, I will come back to you. I have an application note related to Bluetooth and the MFI IC (authentication processor), but in German language only. I will translate it for you and blog it here.